The FTA course was held from July 17th to 20th for two engineers from SM Polska Sp. z o.o. S.K. (Poland) in order to improve their knowledge of Soilmec products and technologies. The course was made up of two parts. They spent the first days in FTA classroom alongside the LCS Department and then completed their session on the jobsite in the new Soilmec test field during the second part. They attended classroom lessons on the ADV line SR45/75 rigs, analyzing the various installation procedures with the teacher, especially with regards to the onboard electronic and hydraulic systems and then implementing these concepts on field. The diagnostic elements have been taught for possible failures in the machine, and thanks to the DMS simulator, the two engineers were able to deepen their knowledge of the practical DMS to understand workflows supported by DMS, settings and common operations board. Finally, they spent the last day on Soilmec test field, that allows the participants to put the theoretical concepts learned in the classroom into practice. There, it is shown how to perform the necessary operations on the rigs while respecting the highest safety standards. The opportunity to interact directly with tutors and to put into practice the concepts learned in theory have brought a very positive result, that is a substantial improvement in technical knowledge, in particular by strengthening team spirit. 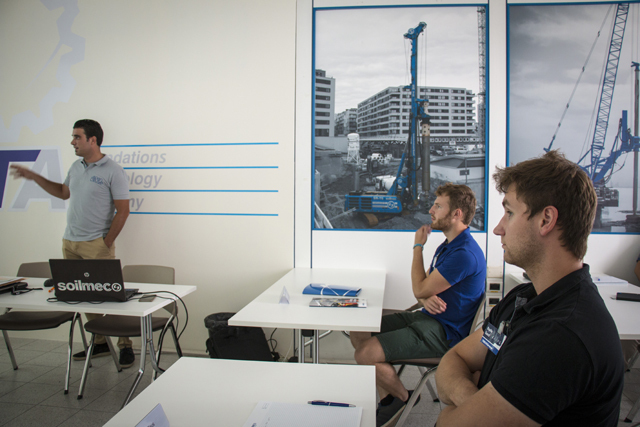 The effort, energy and enthusiasm of the Soilmec tutors helped to facilitate this outstanding educational experience as well as developing and improving Soilmec customer care solutions.